Women shop for bling at a stall in the Silom Road night market. 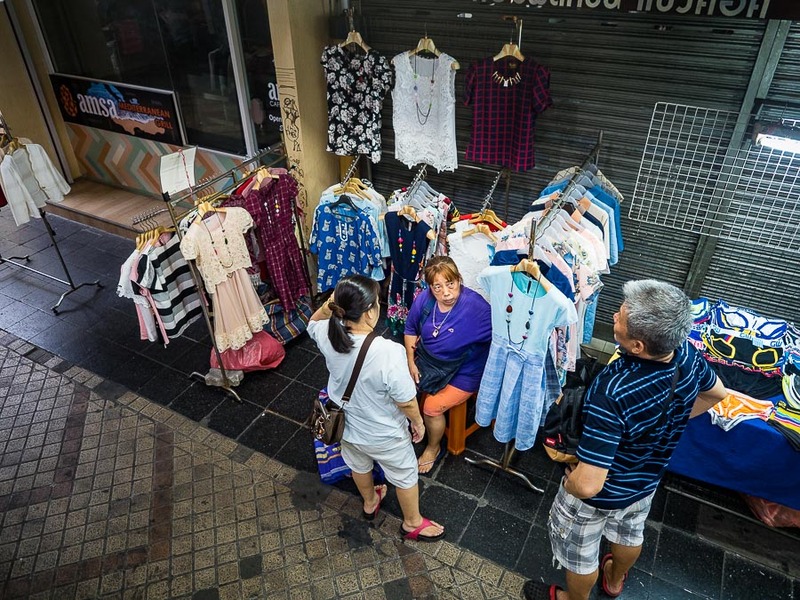 Since the coup in May 2014 that deposed the elected civilian government, Bangkok city government has gone on a binge of "cleaning up" city streets and closing the city's iconic street markets. This is an incomplete list of the markets that have closed by the city: the street market at the flower market, the amulet market at Tha Chang, the electronics and toy market at Saphan Lek, the street market around Banglamphu (close to Khao San Road) is scheduled for closing. 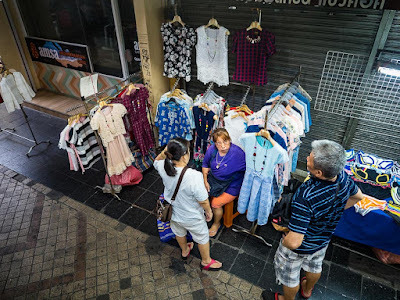 Usually when a street market is closed, the Bangkok Metropolitan Authority (BMA) makes an announcement that the market is closing in about a month. There's a flurry of meetings between impacted vendors and the BMA, the deadline is extended for a week or two, sometimes an extra month, then the market closes. So far every market targeted for closure has been shutdown. A vendor rolls his merchandise down Silom Road to his stall. 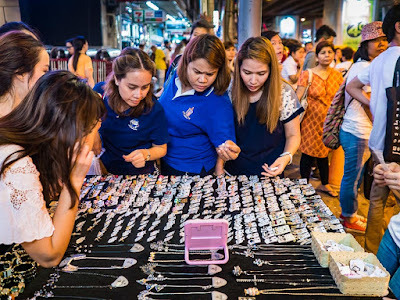 The vendors are not wealthy people, in some cases they're migrants from poor parts of rural Thailand, struggling to get by. The markets are very organized. 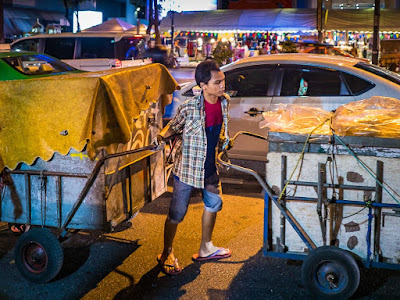 Vendors store their merchandise in rolling cabinets, bringing them out and setting up after sunset and putting them away (in rented spaces in nearby buildings) when the market closes, well after midnight. 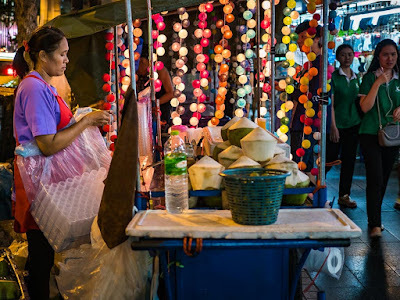 A woman sells coconut water from her rolling cart in the Silom night market. I like the street markets. They're a part of Bangkok's chaotic life and they provide an economic lifeline to poor Thais. I know that they're not entirely legal (or even a little legal), but I wish that some sort of viable accommodation could be made for the vendors. 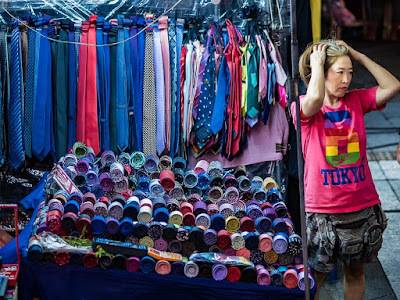 Clothing vendors on the sidewalk. Tourists walk through the market. 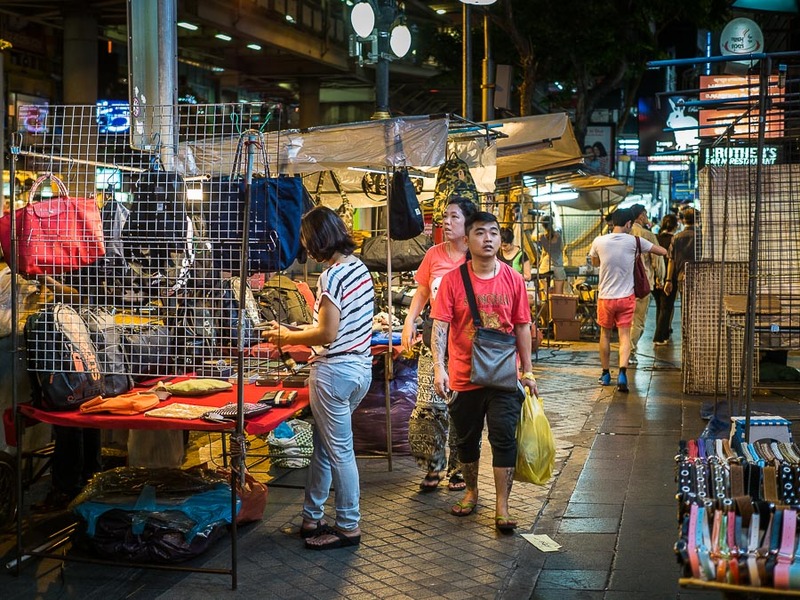 There are more photos of the night market in my archive or available from ZUMA Press. 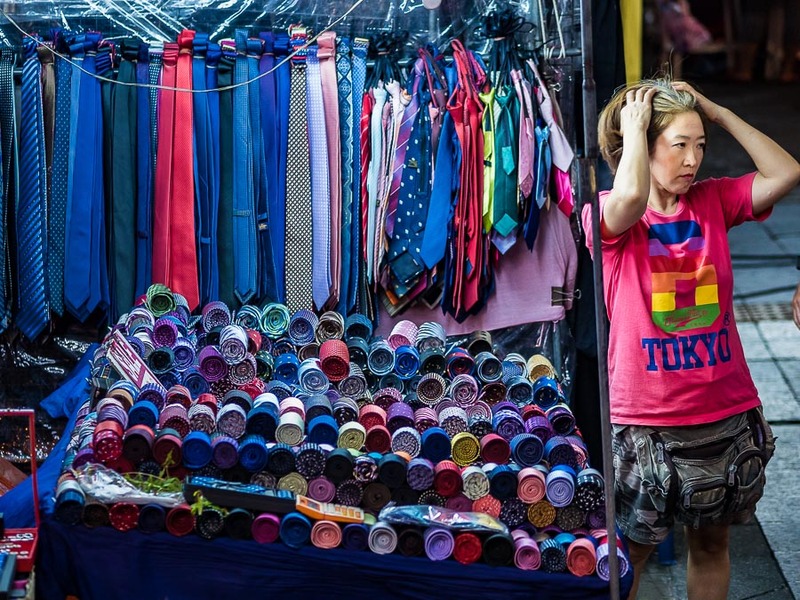 A woman selling ties waits for customers.